Found five more eggs this Thursday. If they all make it to adults, that'll be 17. 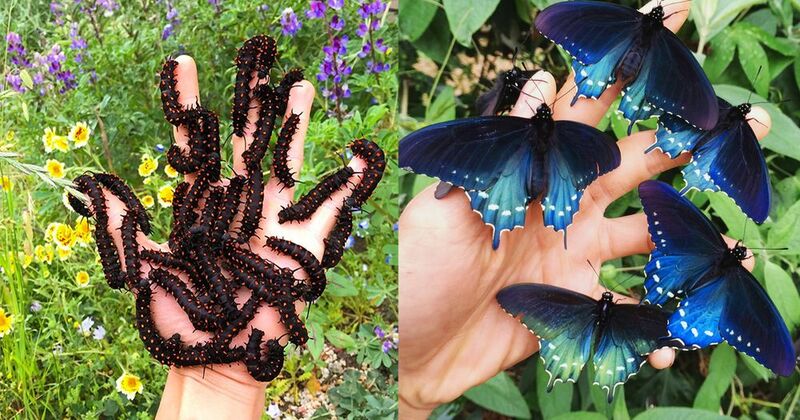 There are scattered reports of pipevine swallowtail communities in various parts of Los Angeles, Orange, and San Diego counties. 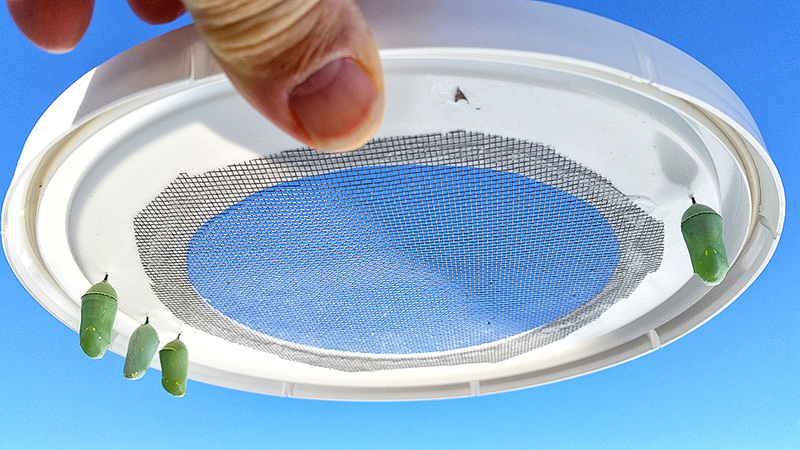 I planted their host plant, the pipevine, in several areas of Alta Laguna Park when I was Parks Gardener for the City of Laguna Beach to attract and retain any pipevine swallowtail drifters that may wander in, but since my retirement, the vines have all vanished. 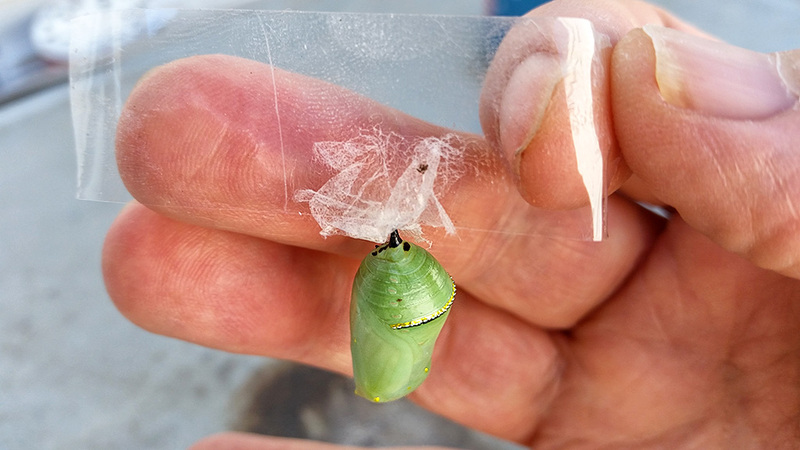 At times, it may be necessary to moves butterfly chrysalides for whatever good reasons. 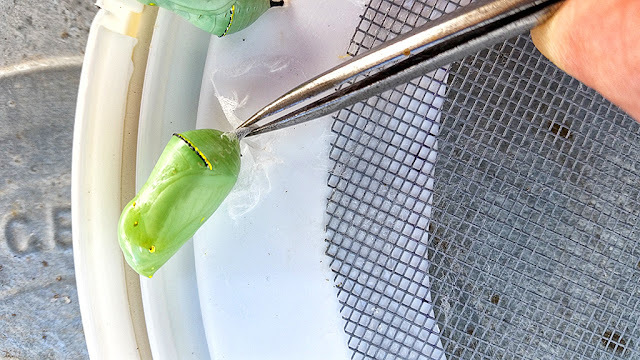 For the Container Butterfly Garden, it usually means I didn't get the chance to place 4th and 5th instars in the eclosing cage before they pupated. As such, they must be moved. Four Monarch chrysalides hanging inside of 4th and 5th instar rearing bucket. 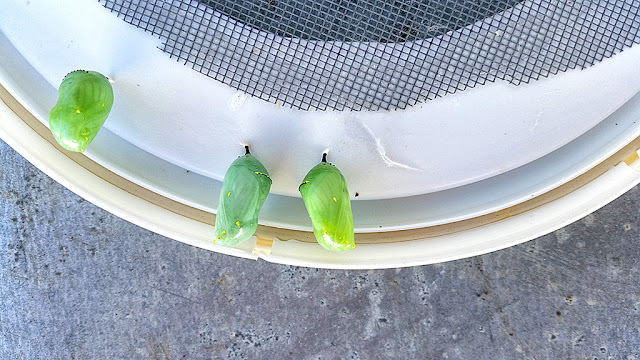 Flipped the lid over to access chrysalides. With pointy jeweler's tweezers, I carefully loosen the silk webbing around the chrysalis that attaches it to a surface. It is then grasped by its tiny stem (cremaster) on the little green chili pepper, and then carefully lifted off. ¡Voila! 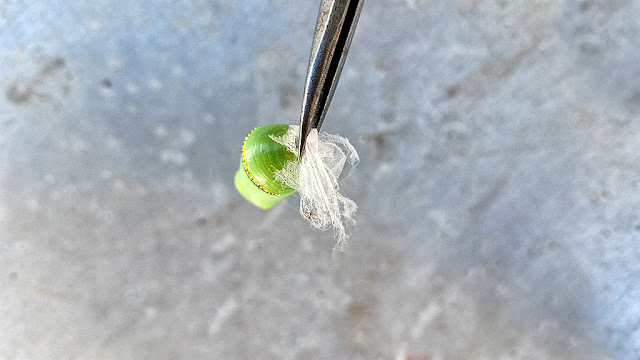 Safely removed with silk still attached. Sticking the silk on to cellophane tape. 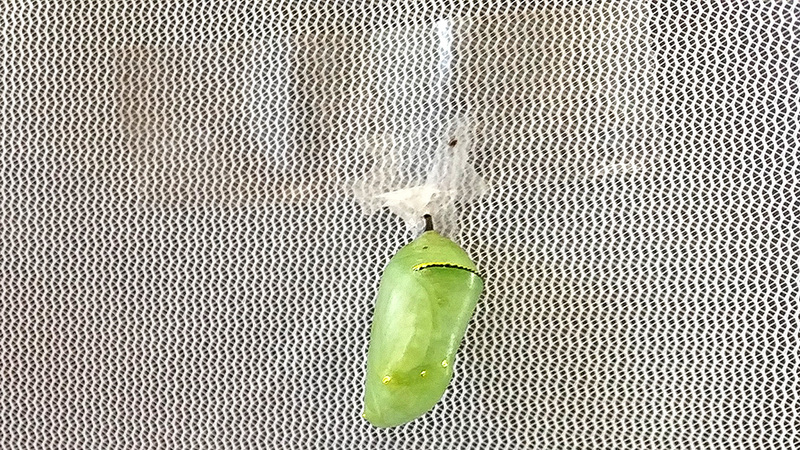 Be careful not to place tape on the chrysalis itself. 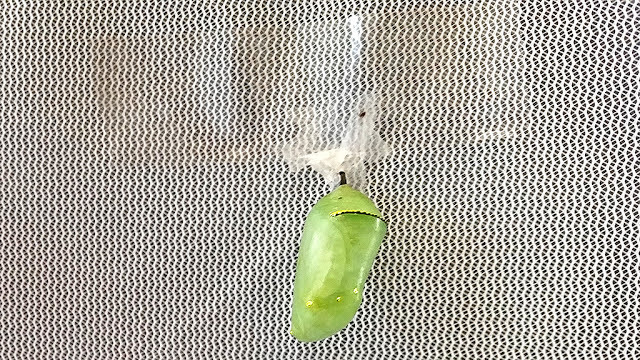 Affixing it to the inside wall of the eclosing cage. 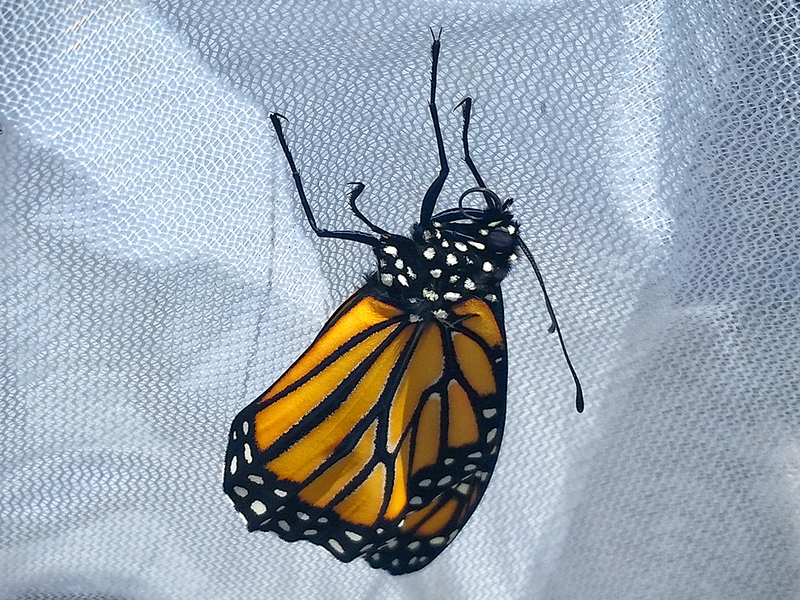 Ultimately, we end up rewarded with a beautiful living jewel such as this recently eclosed female.